Garden/Cafe coming soon to Bethesda, MD. Gifted with a long and narrow windowless space, the concept for Meokja Meokja became clear from the start. Recreating the ambiance of the alley streets of Seoul, the space is dark and dimly lit with a window to the kitchen as the beacon at the end of the road. Industrial brick, walnut, and black accents anchor the space. Located in the Federal Hill bar district in Baltimore, Maryland, 101 is a tribute to a basement hangout. Grandma-green tile and 70's racing orange are a familiar, yet upscale backdrop to home-cooking and vibrant milkshakes (with or without booze). Pop-up food retail & flexible meeting space exist in re-purposed shipping containers to transform the suburban office park with new amenities. A Mexi-Cali garden party backdrop with Frida Kahlo staring as muse, the mural painted across the storefront of Banditos is both eye-catching and adds color and life to the restaurant and streetscape. Located in the town of West Hartford, Connecticut, Division West is the balanced combination of European bistro dining with casual American roots. 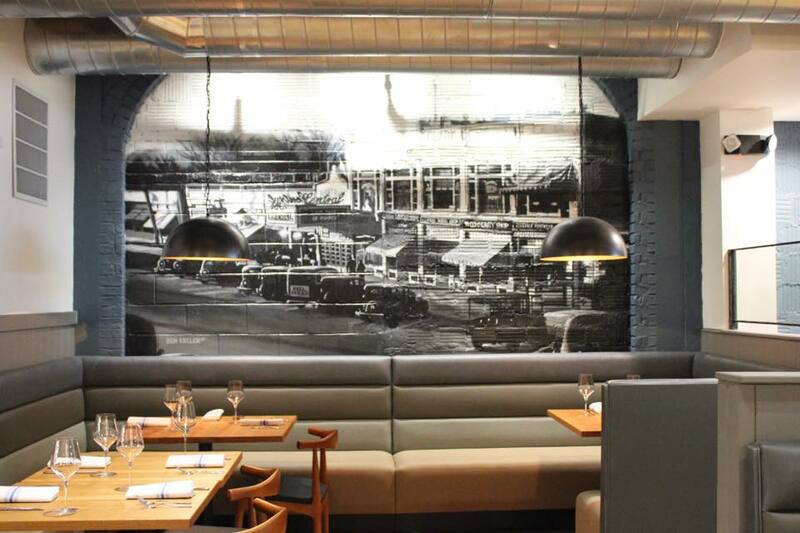 Designed as a social bistro with dining areas spaced focused around a large peninsula bar. Muted grays and blues are anchored by natural white oak flooring and ceilings with the occasional glimmer of hammered bronze and copper.